ClorDiSys Contamination Control Blog: One of the biggest benefits of chlorine dioxide gas is how small it is! One of the biggest benefits of chlorine dioxide gas is how small it is! 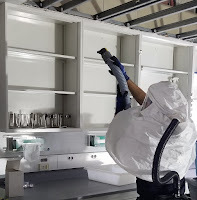 In order to completely decontaminate a space, the method/chemical used must be able to reach and contact all organisms and pathogens with the area. One disadvantage decontamination methods can have difficulty with are crevices and other niches. These scratches, gaps, screw threads, and other hard-to-reach places can be difficult for most decontamination methods to penetrate, leaving those surfaces not contacted and potentially still contaminated. Chlorine dioxide gas has a molecule size of 0.124 nm, which is smaller than the smallest known virus, porcine circovirus, which measures 13 nm in diameter. With a molecule size 100x smaller than the smallest virus (coupled with the fact that chlorine dioxide is a true gas which fills the space its contained within evenly and completely) chlorine dioxide gas is able to reach and penetrate into all crevices within a space deeper than pathogens can reach. This leaves dangerous pathogens with no place to hide, and leaves your facility with no place to worry about.